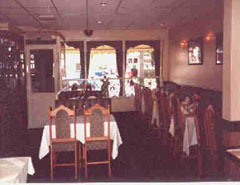 For superb, classical Balti dishes visit the Savar Balti House. Dine in the restaurant or enjoy at home. Free local delivery service or 10% discount on collected orders. Free bottle of wine on collected orders over £20. Open every day for lunch and dinner 12.00-3.00pm and 6.00-12.00 midnight. All credit cards accepted. Classical balti dishes together with traditional favourites and chef's specialities. Spicy korai dishes, tandoori and a wide range of Indian breads.